Become a full-fledged WAGS member by attending a membership meeting, completing orientation, and paying your membership dues. For more information about becoming a member, visit our page Become a Member. Sign up for WAGS 101, read the manual, complete the pre-test, and then attend and complete the WAGS 101 class. Volunteer to assist with a WAGS Ambassador Evaluation before you and your pet test. Complete the registration packet and health screening forms provided and mail them to our wags scheduler. Sign-up to be scheduled for the WAGS Ambassador Evaluation. Evaluations take place four times each year. See our events for upcoming evaluations. You must pass the evaluation with a Level 1, 2, or 3. This number is based on how well your team did in your evaluation and will help you determine which facilities will be the best fit for you and your team. As a newly certified team (Congratulations!) you will complete a mentored visit with one of our designated mentors who will evaluate and support your team through your visit. 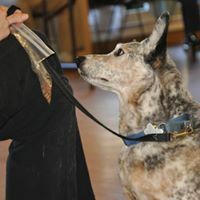 The mentor's job is to make sure your first visit runs smoothly and that your dog is performing as well during the visit as they did in their exam. Once you have passed your exam and completed your mentored visit, it is time to choose a facility to visit. One that best suits the personality of you and your pet. If you aren’t sure, reach out to your buddy assigned at orientation, a mentor or a skilled assistant, or a Trained Aid and talk to them about their thoughts and experiences. Everyone at WAGS believes in the importance of sharing our animals with others and we love to help a new members.